Make this impressive looking salad with almost all store bought ingredients tossed together with a quick vinaigrette! Cube and peel sweet potatoes. Toss with 1 tablespoon olive oil. Spread on foil or parchment covered baking sheet. Chill for 30 minutes or over night. In large salad bowl, add greens, blue cheese, sliced apple, pecans and chilled sweet potatoes. Toss with dressing right before serving. You will not need all the dressing. About 1/4 cup should work it or to your liking. 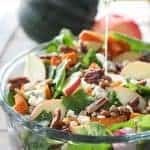 Tips to make this Beautiful Autumn Salad! Sub feta, goat or gorgonzola for blue cheese. Any kind of apple will work. Honey Crisp and Fuji are my faves. Add dried cranberries for an additional kick of color. (I bought them and forgot to toss them in... ugh). Toss right before serving. This salad wilts rather quickly. You will NOT use all the dressing. Use about 1/4 cup. Taste and adjust if needed. Makes enough for 6 side dish servings. Easily doubles with no need to make additional dressing!